Cloud computing has begun revolutionizing the way that businesses are made and structured. When companies used to have to invest thousands, or even millions of dollars, in software and hardware, the cloud is slowly replacing that with viable alternatives that companies can leverage to save costs. Furthermore, Net Worth with Terry Bradshaw highlights how individuals can save money with cloud computing as well. 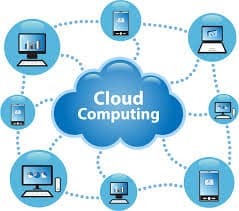 Cloud computing has opened a whole variety of services that customers can use at low cost or even free, when they would have typically had to pay for these services in the past. The reason is that cloud computer, along with being cheaper and offering more options, also allows for different revenue generating models, which can benefit the end customer. Here are some common ways that you can save money with cloud computing as either a business or an individual. The first way that businesses have been taking advantage of cloud computing is to outsource their server needs to cloud computing providers. It used to be that a company had to maintain a massive server and other computer needs within their own company. That was very costly, required expensive equipment, and also required that companies pay for expensive talented individuals to run it, even though technology may not have been their core business area. Now, however, companies can outsource their servers and other hardware needs to cloud computing providers like Amazon. They essentially rent server space for a set cost, and they don’t have to worry about ownership of these servers, or even maintenance of them. This has been an effective way to save costs on hardware, and even software needs of the company. Many companies have started to take advantage of this for both internal and external needs, and have even started to use more cloud-based software to really minimize the need for individual workstation updates and programming. All of this can really save a lot of money on Information Technology services. Business accounting is another area that has been moving the cloud and has a lot of money saving options for small business owners. Net Worth TV notes that many small businesses are working from home or working on the move. They also don’t have the capital to invest in expensive accounting software to account for their revenues, as most make less than $100,000 per year. That is where cloud solutions have really become beneficial, because there are a lot of free or low cost cloud accounting programs available to small businesses with these specific needs. Plus, since the accounting is now online, business owners can access their accounts from anywhere and invoice as needed no matter where they are. The Net Worth Television series has discussed personal finance software quite often, but this has been another area where the cloud has become a money saving alternative for many people. It used to be that individuals had to keep track of their finances on their desktop computers via software or a spreadsheet like Excel. Now, however, there are variety of cloud based personal finance software options that individuals can use to keep track of everything. This not only is convenient, but most of these solutions are free for customers. They may have to accept advertising on the site, but otherwise there is no cost. This is a great money saving option for moving to the cloud. Finally, a lot of software options that were previously only available on the desktop have started to become available on the cloud. The most popular office software – Word, Excel, and Powerpoint, are now all available with free versions on the web through providers like Google. These solutions allow you to create and save your documents from anywhere, which is convenient. These solutions are also free, which can save you hundreds of dollars compared to the cost of these programs for your computer. As cloud computing is only beneficial if you have internet access and ours is iffy a lot of the time, it’s unlikely we’ll be embracing the idea for most things any time soon. But it’s great for those who are confident in their ability to access what they need when they need it. When considering switching over to the cloud, just think carefully about the benefits vs. the risks for each situation and consider whether lack of access for a period of time would be a problem.